Tot School is time spent each day with your toddler exposing them to different ways of looking at and working with a varied set of items. That's all I've got so far :-) I mean, the woman who does the website has planning sheets and assessment sheets and GOBS of other things that go along with it. I had my fill of those things while teaching and I feel like now, just like I felt while teaching, that filling out forms all day means you aren't spending much time teaching anything. Or, you are staying up till all hours doing paperwork. SO, I am adapting Tot School to suit me and my child. Of course, some might say "well that's what we are doing all day with our toddlers isn't it?". I don't know about other moms, but aside from trying to educate my child I am also running errands, going to the park, cooking dinner, doing laundry, playing, etc. etc. To me, Tot School is just a little bit more structured play. It's also a time where you bring out things and utilize them and then put them away. That way your child is less apt to get bored with them and you can see a progression of their learning. Ok so I am getting a little too in depth here. Let me just tell/show you, so far, where I'm at. Activity #1 - Stickers - This doesn't really fall under a specific activity, but I have an abundance of stickers leftover from my classroom. I cut a large piece of poster board in half and give her one sticker at a time to apply to the poster. She is very good at this. However, she also fed two stickers to Molly. Activity #2 - Transferring with pasta - I put a box of pasta in a tupperware container, gave her measuring cups, and started to show her how to move the pasta from one container to another using the cups. 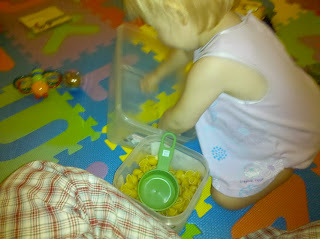 She prefers her hands at this point, but she transfers the pasta very well. She LOVES this activity. 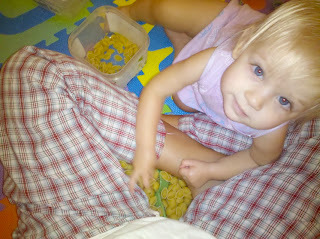 She also has always loved hiding things in my lap when I am sitting Indian style on the floor. And she also fed Molly some of the pasta. Activity #3 - Clothespins (sorting or transferring) - I also had a lot of clothespins from my classroom. Some are plastic and different colors and some are the wooden kind. I am trying to show Lila how to clip the pins to things and sort them, but she is still too little for that. She likes playing with them and taking them apart when I attach them to each other. And she didn't have to feed them to Molly because by activity #3 Molly took it upon herself to eat one on her own. What have we learned? Lila may be a little young still for some of this, but it's a lot of fun and a good start! Molly may have to be expelled from Tot School until Lila learns that we do not feed the dog. 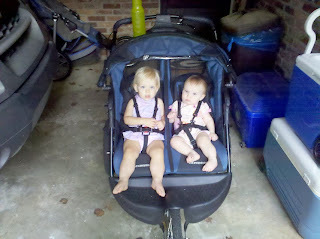 So, somehow I just wrote a much longer post than I planned because both babies are still sleeping! I would say I am just that good, but it's really a result of cause and effect. Lila woke Carson up twenty minutes after Carson went to sleep so I think Carson is making up for the interruption by sleeping longer. I will take it! I also want to brag about my latest Craigslist find...a double jogger in fabulous condition! Wow! If/when I ever have children I am enrolling them in the Burrow Baby Bonanza! You're awesome Jana!